The is from the December 11, 2006 program. 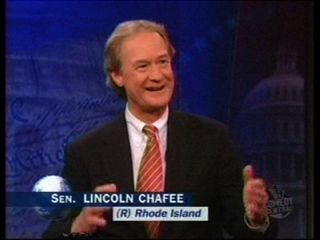 Senator Lincoln Chafee (Wikipedia) is an outgoing Republican Senator from Rhode Island who is generally on the right side of every issue ("right" meaning I agree with him :-) not "to the right"). Jon asked a lot of really frank questions, and Chafee had some really honest answers. Especially with regard to the kind of blind devotion many repubs have had toward the presidents policies - no matter how crazy they became. Jon: It must be tough, you know. You're a guy. You're considered a "moderate republican." There was yourself, Olympia Snowe (R - Maine), Jim Jeffords (I - Vermont), considered an independent switched over to be an Independent. Eh, kind of a lonely lunchtable there. Chafee: Yes. Fewer and Fewer. We started with five when I got there. Jim Jeffords left the party. I was defeated. So there's three left. Chafee: We'd have lunch every Wednesday. Arlen Spectre, Olympia Snowe, and Susan Collins, Jim Jeffords and myself so two down, three left. Jon: I was kidding. I was kidding. And yet, that's really what happened? Jon: And when you would do that would they throw food at you guys? What would happen? Chafee: Well it started in the 80's and 90's with a much more robust lunch of moderate Republicans. But through time, fewer and fewer and it down to when I got there in the late 90's - 1999 - five of us. Jon: That's maybe one of the saddest things I've ever heard. Chafee: The whole caucus just lined up behind the President, and, so the agenda is set by the President. People line up in Congress. Jon: But once you get there. Once you've won. Why is it so antithetical to the process to stand up and say "hey this is crazy. We are not supposed to just rubber stamp this guy, even though he's in our party. Why can't we stand up or why can't we work with what we think are reasonable people on the other side?" Where does the party discipline come from? What are they threatening you with? Jon: That's what I'm saying. You were there! I wasn't there! Chafee: I stood up and said "No." And I argued with my collegues. "What are we doing here? We just got out of deficits. Why are we having a big tax cut?" Chafee: Good question. I think it's just "loyalty to the president." That's what I found in my time there. It's the president. That's how he wants it. Get behind the president. That's what I heard. More than threats. We're gonna take away some project for Rhode Island. It's just; Support the team. Fight the Democrats. Jon: So it's like the big game. Chafee: Yes, but our country, you might argue, suffers. Jon: You might argue, and in fact. I mean I think in some respects I always assumed that there was something going on behind the scenes that was far more complex that I wasn't quite understanding. But the idea that you've been there, and you're saying "yeah, I don't know what's wrong with these guys either," really has me a little bit...I have to tell you I'm a little shaken up right now. Jon: So do they go down there with Cheney, and it's like the pod people? He bites their neck and then the next day it's like (arms extended) "we can do this!" Jon: And are the Democrats any better? Are they fighting? Or are they just disorganized too? Are they the same? Chafee: Well they went through being disorganized after 911. The Democratic party just didn't stand up. They all fell in line behind the rush to war. Senator Daschle, Senator Clinton, Senator Kerry...all of em, lined up, and there was never any evidence of Weapons of Mass Destruction. Jon: Can you point to anything in the last five years you think Congress should be proud of? In the last five years, since 911, in your mind? Jon: Can I ask you this: Is that the platform you ran on?